Chester City Council - now Cheshire West and Chester Council - an example of licensed thuggery using Section 215 of the Town and Country Planning Acts. If local councils have nothing better to do than expend time telling residents to destroy areas of wildlife habitat just because an arguably narrow-minded or vexatious neighbour complains, then both their funding levels and staff numbers need to be reduced. Do people really want council tax to be spent pursuing small-minded vendettas? If local councils became heavily involved in every neighbourhood spat involving a few overhanging branches then we would need to employ hundreds more local government officials. Maybe that is the aim! This part of SeeRed documents just part of the dispute that occurred when Leslie Smith (then a planning officer with Chester City Council) tried to exceed his proper authority. More seriously, this is one of many examples of why s.215 of the Planning Act needs to be repealed - simply because local councils clearly cannot be trusted to use this draconian legislation fairly and for the purposes for which it was originally intended. Probably the only people to emerge with some credit are the staff of Chester Magistrates Court who were helpful both to me (SeeRed author) and to the person who was being threatened with prosecution - and under legislation that deems anyone guilty until they prove their innocence. This case dates from 2008. A more resent (2010) case was reported nationally in the Press and because it was heard at a Crown Court may have set some sort of case law upon which others can rely. Cases heard in lower courts do not set a precedent. We need the tonic of wilderness ............... We can never have enough of nature. This section of SeeRed documents the case of a resident of Chester whose only 'crime against the State' was to allow his garden to become overgrown. A neighbour (probably a devotee of Chester in Bloom - a part of Britain in Bloom) complained to the City Council. The complaint was met not with a proper investigation of all the circumstances but with dictatorial threats under s.215 by Leslie Smith - a senior planning enforcement officer. The whole episode, even in the first couple of weeks, read like something out of Franz Kafka's "The Trial". A formal notice under S.215 was issued in September 2008 - a few days before press comment centred (once again) on saying that local councils should mind their own business and allow people to grow what they wish in their own gardens. The formal notice is reproduced here, and the press comment is here. Here is the text of the first email I received. The house owner had searched Google and found my section 215 page. I have been reported to Chester City Council by a neighbour about the state of my back garden. It is overgrown by natural growth of what could be considered weeds. I disagree. I have let nature do what it does naturally. I have no idea what they are but I must admit that they are quite tall. I estimate the tallest at around 12 feet. I have been visited by a senior planning enforcement officer who told me that I would have to clear the garden in order to accommodate my neighbour's wishes. There is no rubbish, just natural vegetation. My neighbour, the complainant remains anonymous but I think I know who it is. He has a perfectly flat lawn and is probably proud of it. I disagree. I think his garden is worse than mine as it is not natural but man made. Everyone must remember that vegetation provides vital oxygen and a place where wildlife can freely exist. 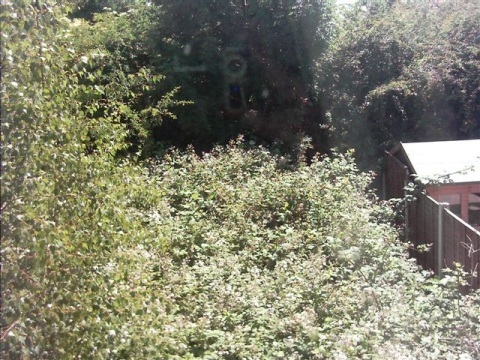 The complainant and council consider my back garden as an eyesore. I suggest that if they don't like it, don't look at it. There are problems with dogs around my house, they bark constantly. This is something that cannot be ignored. You can close your eyes but not your ears. However, I have not complained to the council about this nuisance as I am not a petty person. 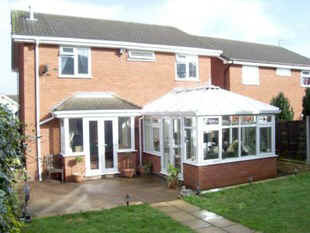 Can you give me some advice regarding the back garden? The house owner asked Chester City Council for details of the complaint - and quite reasonably who had complained. Here is the response - note the emphasis on criminal proceedings. Requests under the Freedom of Information Act are dealt with by another officer and I have copied this e-mail to him. At the present time you have not committed an offence but a failure to improve the land may result in the service of a notice requiring that certain works be carried out. Failure to comply with the notice would be a criminal offence. In view of this potential outcome our view is that the information you seek is exempt under the freedom of Information Act as it could alter be disclosed to you under the Disclosure Rules in criminal proceedings and that the premature release of information could hinder a criminal investigation. I can tell you that the complaint was made by telephone and the only communication I have had thus far has been by e-mail with you and a council officer who deals with private sector housing. The garden in question is well screened from public view - unlike the famous Sidford Wild Garden that was the subject of so much publicity and orchestrated venom many years ago. Part of an often admired 'wild' garden near Sidmouth. 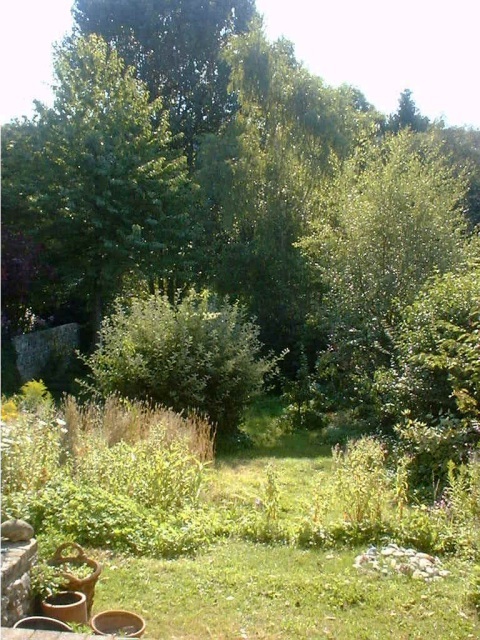 Much of this garden in summertime was a dense wilderness full of wildlife. Parts of the lawn were cut maybe twice a year. The adjoining property was formally arranged with lawns and carefully weeded flowerbeds - and a summerhouse costing tens of thousands of pounds! But these properties were not on a high density new estate. 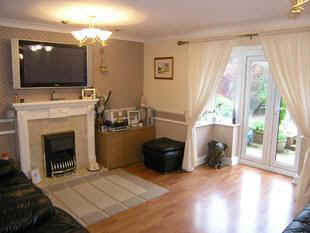 They were occupied by educated people who could respect different styles and tastes. Many of the trees had been planted by the owner - some of them supplied by East Devon District Council under its 'free trees' scheme. If any new owner were to dislike 'untidiness' most of the wealth of habitats and biodiversity would be destroyed. A view of the disputed garden in Chester. 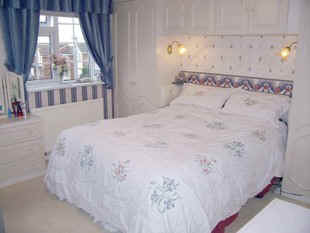 Certainly there is a mass of vegetation, including a 3.5 metre high tree, no 'rubbish' such as old sofas, and it is to the owners taste. Tall fencing panels can be seen - as in the 'birds eye' photos. Similar gardens in the UK have been ordered to be 'cut down to the ground' by council officials. Other owners have been ordered to cut down all vegetation (including trees?) 'to a height not exceeding one metre', so as to comply with the preferences of vexatious neighbours of the 'Britain in Bloom' variety. 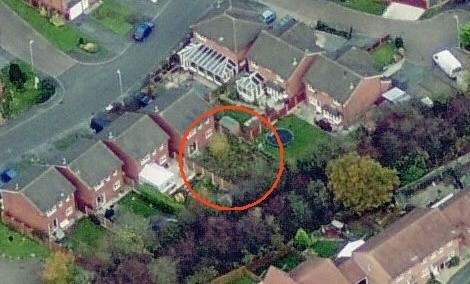 Quite an old aerial view is shown below: the estate is an outwardly pleasant development in a suburb of Chester. To the rear of the property there is a line of tall trees and other vegetation. Amidst all of this, the garden in question can hardly be said to be 'out of place' - it is merely a small extension of a band of woodland. A tall hedge along one of the adjoining properties gives privacy both from the 'disputed' garden and from the large area of manicured lawn in one of the other adjoining properties. Again, this hedge appears to be taller than much of the vegetation that Chester City Council tried to order be cut down. 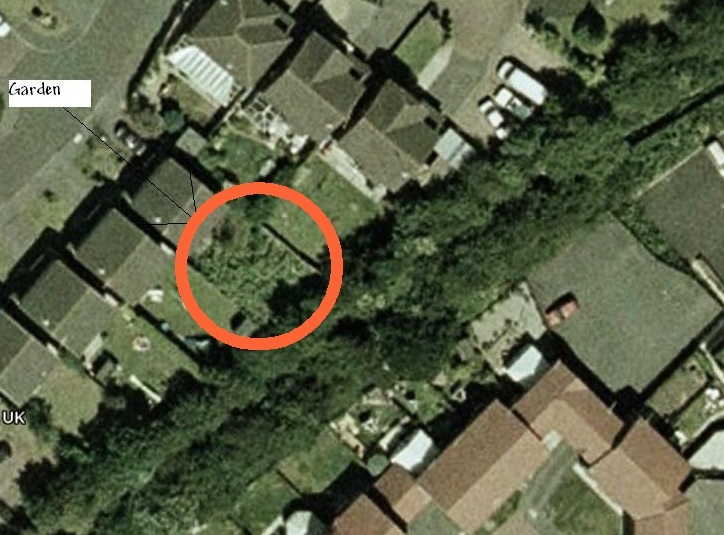 The complainant may be the person who lives in the large house to the top right - there is a large white van at the front and a large area of mown lawn to the rear - this lawn abuts the side fence of the 'overgrown' garden. Another aerial view, this time from multimap is shown below. There is a large trampoline in the rear garden of the house that may belong to the complainant, and a small neatly mown area of front lawn. Having two areas of neatly mown lawn is doubly bad for the environment - lawnmowers are polluting and noisy. Short grass also needs watering in droughts (as do most Britain in Bloom plants). In all, maybe the council should be applauding the owner of the wild garden, not threatening him. The large white van may indicate that the presumed complainant is in some sort of market trader, builder or similar occupation. If you were buying an adjoining house, you might want to know about this 'commercial' vehicle often being parked here. 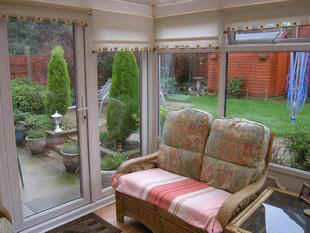 Many people now use these on-line aerial photographs in their househunting! More recently Google Steeetview has also become popular. The front garden of the house under dispute does not have a neatly tended lawn as do so many of the others - but untidy as it might be, it probably has greater ecological merit. Several gardens have trees in them, several have tall hedges, and no doubt some even have a few weeds. Panel fencing supported by concrete posts is a feature of the estate. Any vegetation that overhangs adjoining gardens can of course be cut off (but in law it should then be returned to its owner). Such matters are a commonplace part of living alongside other people and should never become the subject of legal action - and especially not under the draconian and one-sided provisions of s.215. Indeed, it is curious that special legislation was needed to deal with a few cases of 30 foot high conifer hedges that were genuinely a serious blight on neighbouring properties! Now, let us indulge in a little speculation. Can a few pictures tell a story? It is not difficult to see why this dispute has arisen. 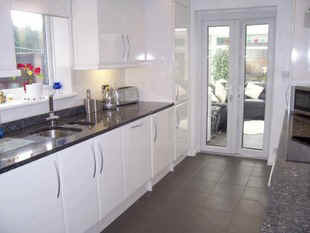 The area is a moderately high density new estate with a mixture of house sizes and values. On such estates people live almost on top of each other and this provides ideal conditions for simmering resentment. People living in the most expensive houses may look down on their poorer neighbours and consider that the Council should automatically take their side in any petty dispute - after all, in local government as elsewhere (and especially in planning departments), money talks. The 'posh' 4-bedroom houses are typical of those inhabited by the newly wealthy - business people made good, for example. 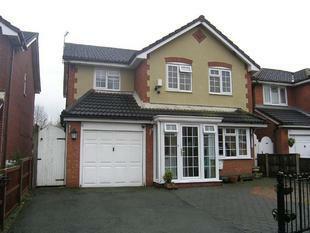 Examples of 4-bedroom houses in this area of Chester. The whole estate has an unfortunate uniformity with small gardens and manicured neatness. In these conditions it is common to find neighbours squabbling over fences, overhanging bushes and the like - they live too close to each other and seem to have nothing of substance to worry about! Regimented order was designed into the estate. The pretentious architecture of the typical 4 bedroom houses would always attract people to whom appearance matters more than substance. Likewise, the block paved driveways are a fashion statement, although these may be a later addition. They are a characteristic of people (and including many in Sidmouth, home of SeeRed) who have far too much money to spend and desperately need the world to know about it. A �15,000 driveway is in effect merely a social statement - it serves no useful purpose over and above that served by the often adequate driveway that it replaced. Wanton consumption of raw material in this way is of course highly environmentally damaging - yet you would expect councillors of all types to applaud the house owners for 'improving their properties'! Most of the gardens are small, formal and with little apparent wildlife potential. Some examples are shown below. 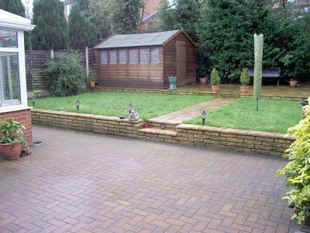 Paving over large areas of garden has been recognised as a factor leading to increased surface water run-off in heavy rain - and is nowadays controlled under planning legislation. There are no rambling hedgerows, no untidy areas to offer a mix of wildlife habitats and probably no garden ponds worthy of the name. 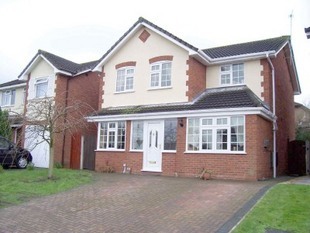 The sterilised neatness outdoors is mirrored indoors, as shown in these views of typical 4-bedroom houses. Nothing is out of place, everything is sparkling, deodorised and the very latest in pampered consumer living. In all, they are a wholly artificial environment. As priorities in the UK move towards greater self sufficiency in food supply, imagine the uproar if one of the residents started to grow vegetables in his front garden - or even to keep a few chickens! But arguably, this is exactly what forward looking local councils should now be encouraging. I have argued elsewhere that having the populace attaining such a high standard of material living is merely a passing phase. Unfortunately, this type of estate development can be seen throughout England. Expensive cars are washed weekly - keeping up appearances is so important - and any blade of grass or environmentally useful 'weed' that is so unwise as to grow is religiously cut down. You can discern a lot about your neighbours from 'birds eye view' maps on the internet, and people now use these extensively when house hunting. Yet no house martin with any sense would try to build a nest here - it would be destroyed well before the eggs hatched - or maybe afterwards because of the awful noise made by the chicks. I know of several cases in Sidmouth - these houses and gardens are tended so that every flower is perfect and every weed destroyed. These prissy 'Britain in Bloom' people are in effect so divorced from real nature (and the untidiness and disorder that are inherently a part of the whole) that they seem to have become frightened by it. Generations of housemartins returned from Africa each year for over 30 years to the same nest site on my late mother's house. 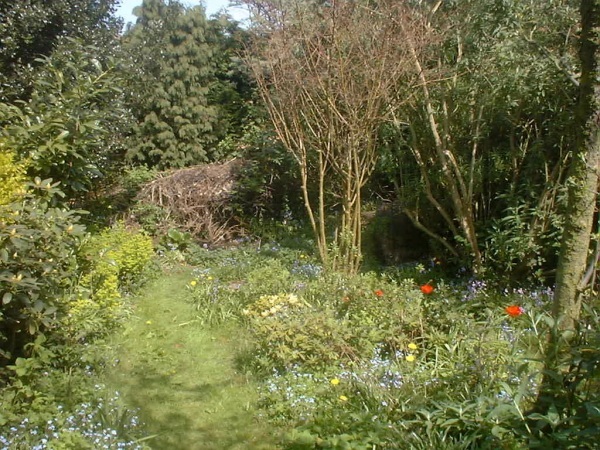 I sold it to someone who said she loved the garden that my mother had created - including the large wild and overgrown areas (substantially untended for maybe 15 years) in which many birds nested. One of the first actions of the new owners was to destroy the housemartins nest. After all, bird droppings are so untidy! They also lavished money on acres of block paving. Keeping up appearances?